Ad Majorem dei Gloriam! : Manny "Pacman" Pacquiao Wins!! 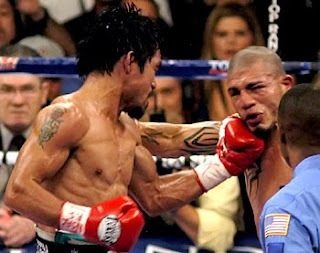 Manny “Pacman” Pacquiao wins over Miguel Cotto via Technical Knock-out on the 12th round of the game. I watch the game last November 15, 2009 Philippines and it was November 14, 2009 at USA. The Fight was held at MGM Grand Arena Las Vegas, Neveda, USA. The fight between them is awesome! Of course I am a Filipino so I am on Manny Pacquiao side. I never thought that Miguel Cotto will survive up to 12th round of the game because he was knock down by Manny Pacquiao twice. I was so pity for Miguel Cotto, his face was full of bruises and his eyes were swelling with blood. Well, I guess that is boxing all about, “Basagan ng mukha at tibay ng katawan”. Lastly, even though Miguel Cotto lost th fight, he shows that he is truly a sports, he came to the camp of Manny Pacquiao and congratulate for his win. All Filipinos is Celebrating Manny Pacquiao win! 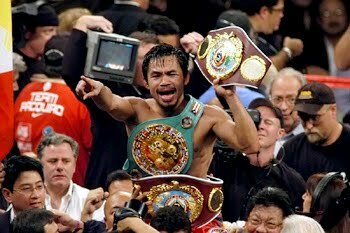 Now, Manny “Pacman” Pacquiao hold the title of WBO Welterweight Champion of the world and 7 divisions Pound per Pound King. He holds the record of 50 Wins (38 by way of Knockout), 3 Loses, 2 Draws.